Viking and slave - the slave is Janice Scott-Lodge. Note the square section wooden goalposts! The 'Viking' was a family friend of ours who had collected this outfit. He was visiting us during Gala Week and we (Ken Scott-Lodge & I) persuaded him to don it for the Fancy Dress Parade. 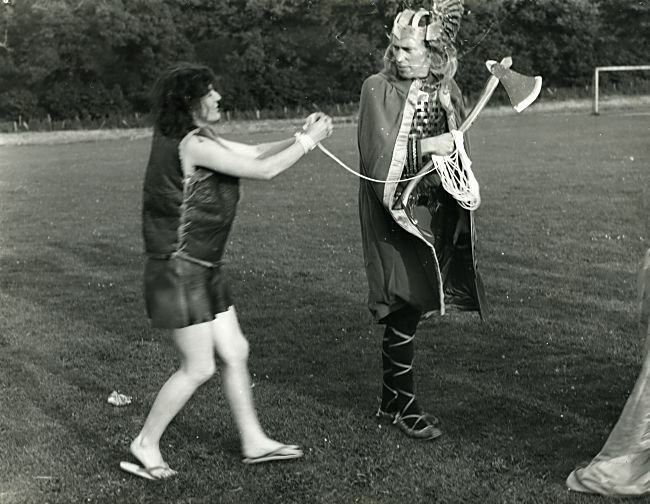 He said he would only do it if I entered as well so I had a mad dash around, dug out an old leather mini-skirt and a leather sheepskin waistcoat that Ken used for shooting, a pair of flip-flops and went as the 'Viking's' captive Pictish maiden! --We won! !